(Colorado Springs, Colo.) – USA Fencing is pleased to announce the 2018-19 season’s third group of recipients for the Fencing Spirit of Sport Recognition Program, recognizing six members of the fencing community who have exemplified outstanding dedication to the sport and are an inspiration to others. Each quarter, one recipient from each region is chosen based on commitment and dedication to the sport as well as his or her club, respect, teamwork, inclusion, passion, sportsmanship and character. All selections will receive a USA Fencing Spirit of Sport t-shirt and bag tag. 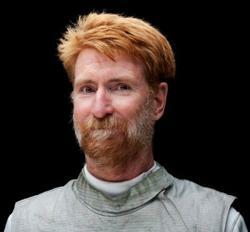 In addition, beginning in the 2018-19 season, USA Fencing will honor one annual Fencing Spirit of Sport winner. After the fourth quarter winners have been announced, a selection committee will name the top selection in each region from the pool of 24 winners named throughout the season. The fencing community will then select the winner from the final six in an online vote available to the entire USA Fencing membership. The overall winner will receive a plaque and will be honored at the 2019 USA Fencing National Championships and July Challenge in Columbus, Ohio. Nominations for the fourth quarter are due May 1. The nomination form can be found here. Bryan Stafford’s generosity and caring nature has not only been noticed by those at his own club, but by those at other clubs as well. He is willing to coach anyone and is super encouraging of younger fencers, asking about their fencing as well as school and their goals. Stafford has also welcomed fencers from the division into his home so that they can save money to attend a clinic. He drives across the state through bad weather to attend tournaments and clinics hosted by other clubs, and takes extra scoring boxes and reels in case they are needed. Although she had never fenced signing up for her high school team, Emma Mensah was immediately a natural and fell in love with the sport. She never misses practice, even attending all the optional ones. 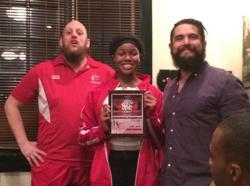 Mensah’s passion for the sport has been infectious and inspiring to her team as they came together to finish second in the state. Mensah has also shown incredible sportsmanship while competing, becoming friends with many of her competitors and asking for pointers after bouts to improve. “Every team would be better if they had an Emma (but you can't she’s ours),” said Greene. 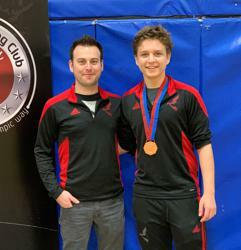 The ultimate team player who wants to help everyone, Mason Moskowitz arrives early to volunteer, teaching the youth class, and stays late to help the developing fencers improve. He covers classes and lessons so that other coaches can attend tournaments and at tournaments, he is always willing to do the little things, taking video, grabbing water, making a coffee run for the coaches or even coaching a teammate if needed. 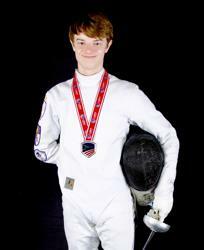 He is also an ambassador for the sport, doing fencing demos at the mall to help grow throughout the area. “Mason is the personification of the ideal teammate. He does whatever is needed to help the team succeed,” Kolakowski said. 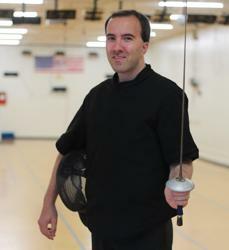 Involved in nearly every level of fencing, Mandoki is a fencer, coach, referee and division officer. After starting to fence in college, he earned ratings in all three weapons. Mandoki then coached the foil team at Galileo High School for 11 years before becoming the director of the sport for the San Francisco Unified School District and earning a Moniteur d'Armes in all three weapons as well as a Prevot in saber. Mandoki coaches and is on the board at Halberstadt Fencing Club, and referees at the local, national and international level. As both a coach and referee, he is known for always being respectful and composed. Finally, he serves as the chair of the Northern California Division and is on the board of the Bay Cup. Known for his hard work and selfless nature, Berton (Jack) Bolerjack will sacrifice his own practice time to help others succeed or fix their gear. Since becoming the club armorer in 2015, Bolerjack has completely restructured the way the armory functions, allowing the club to equip more fencers and keep better track of gear expenditures, which enables the club to attend more tournaments. 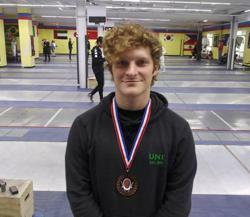 At tournaments, he helps others in any way he can, checking their gear and cheering on his teammates as well as fencers he’s met from across the country. He once offered up his own weapon when someone’s broke during a competition. On the strip, his focus isn’t on winning and losing, but rather learning from his bouts and representing his club and the sport in a positive way. One of the captains of the men’s fencing team as a sophomore, Drew Walker served as a mentor to the newer fencers and assisted with coaching at practice and at tournaments. At the club, Drew is the first to arrive and last to leave, earning the award for most practices attended during the 2017-18 season. On Saturday mornings, he often helps with the beginner practice, enjoying helping others improve. As a fencer, Walker is always striving to be better, watching fencing videos and following fencing social media channels. He then shares his new knowledge with his teammates. Walker is also humble and respectful, always shaking the hand and thanking the referee at the end of pools and each direct elimination bout. It’s not uncommon for him to coach the fencer he just defeated to help them improve as well.